KPETS team Copper Candy and Nan Hanshaw volunteered in several educational booths during the Farm Show January 7th through 14th. Copper drew the crowds for the Pennsylvania Animal Response Team (PASART) and the Pennsylvania Veterinary Medical Association (PVMA). He worked sereral-hour shifts * for several days and greeted hundreds of children and grown ups. 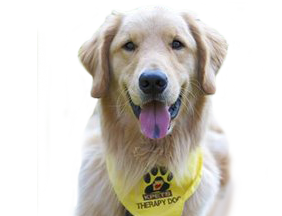 When Copper wasn’t working, other volunteers reported slow attendance at the booths, but as soon as he arrived, people swarmed the booths to pet him and ask questions about therapy dogs. Many people took KPETS brochures along with information that was available in the booths for them. One woman stood in line and waited her turn to pet him and said a heartfelt thank you for all KPETS teams and especially the Hershey Heelers. Her son had been in the neuro unit at HMC and visits from the dogs helped his depression and she is sure helped speed his recovery. Her thank you made all the hours standing in the booths worthwhile that week. * Copper was very tired each day but he never showed signs of stress or asked to leave. It was great to watch him work and realize how awesome our therapy dogs are- they tolerate things most animals never would and they do it willingly for us. It’s great to be part of KPETS.